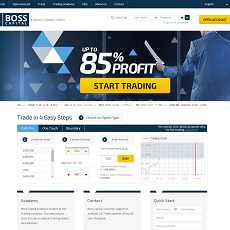 Good: Some of the best trading spreads, real time analysis and comparisons and excellent customer support. Bad: Although you can access their website using your smart phones and tablets, but XForex does not have a mobile app. The foreign exchange market, more commonly known as forex, is one of the fastest growing today. Established in the 1970s, it is also one of the youngest, and it sports the largest daily trade volumes compared to the other markets. Each day there is about $4 trillion of trading in the forex market. That is 30 times larger than all of the combined stocks traded in the US. There are many broker options available online due to the market’s popularity. Our goal is to help you choose the best one for growing your money. In this entry, we take a close look at XForex. 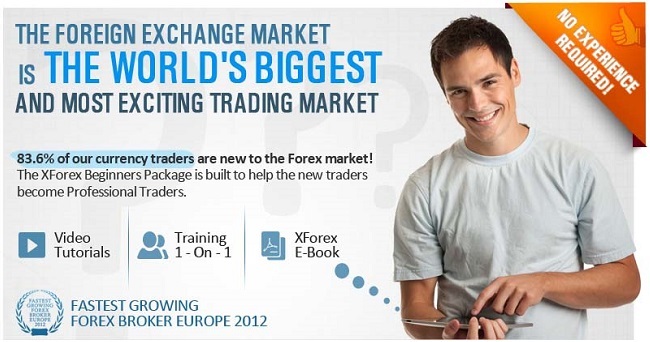 Compared to most of the online forex trading providers, XForex has been around for quite a while. 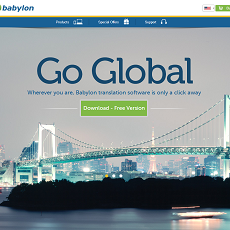 Based in Cyprus, they have been in the business since 2003. 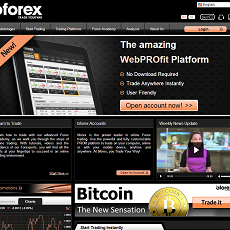 They were originally started by a group of established forex dealers and financial experts. Today, they have hundreds of experienced employees with a presence in 140 countries. 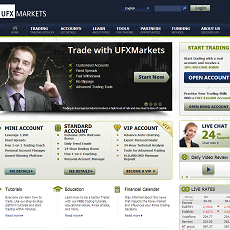 For foreign currency trading, XForex developed their own trading platform for use over the web. 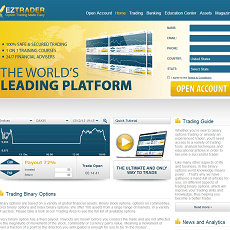 The online platform is perfect for traders because it was developed by traders with the needs for success as guidance. XForex has satisfied clients by focusing on catering to the speed and flexibility of online trading and providing uncompromising financial professionalism. To help achieve these goals, they offer 24 hour per day support and regularly updated financial news to help their clients. When using a forex broker, security is incredibly important. XForex takes security seriously. 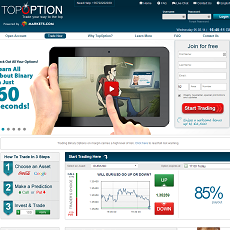 They have a team of security experts that spends its time on making sure the online virtual trading room is secure. With XForex, there are fixed spreads. And, the more you deposit into your account, the better spread rates you get. XForex’s spreads are some of the best in the industry and are a major selling point in winning traders over from other trading platforms. There are also no commissions. XForex does not charge any fees when you open a new position. It is in their best interest to make sure you succeed, since they get their money from the difference between the bid and the ask price. XForex has some of the best software engineers in the industry. 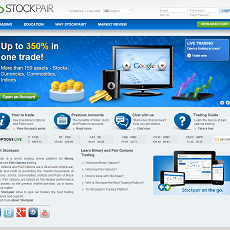 They teamed up to create a state of the art trading platform. There is no need to download any software. 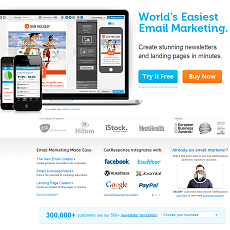 You simply open up your browser – Internet Explorer, Mozilla Firefox, Google Chrome, etc. – and go to xforex.com and log in. 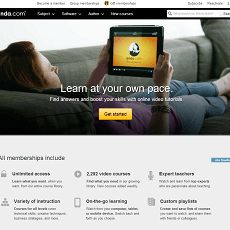 And, this platform can be accessed anywhere in the world you have a computer and an internet connection. All accounts are updated in real time. Within milliseconds of any changes, you can see available margins, account balances, exposure, and the balances of open positions. Real times accounts are crucial to make sure you maximize your earnings. It allows you to have full control of your portfolio and therefore manage it properly. Funding XForex is incredibly simple with the many options they offer. You can use several methods to transfer funds to your account including WebMoney, every major debit and credit card, wire transfers, and CashU. It does not take long at all to get up and running with this broker because the deposit methods allow for instantaneous transfers. You do not need much capital to get going either with XForex allowing minimum deposits of $100. Once you would like to withdraw funds, your initial deposit value is returned using the same payment method you used initially. So, if you paid your initial deposit with WebMoney, that is where your withdrawal will go. Once the initial deposit amount has been withdrawn, the money can go wherever you would like. XForex does this to make sure no one uses them for money laundering. It is a bit of a pain because any bank accounts must have the same legal name as the trading account, but we are willing to jump through these hoops to use a company that is honest and legal. It lets us know our money is safe, and they will not get shut down in the middle of the night and take our money. To help users succeed in trading, XForex offers a whole host of trading tools. 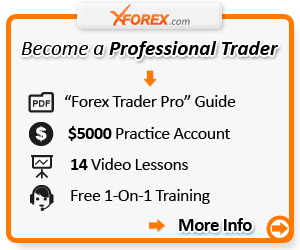 There are fourteen hours of training videos in their library for helping people break into the forex game. The Elite Pro Trader Guide is a useful resource for anyone at any level of trading. If that is not enough, you have access to personal one on one training from a financial expert who has been in the field for a while. There are only really two types of accounts at XForex: the Standard Account and the Premium Account. 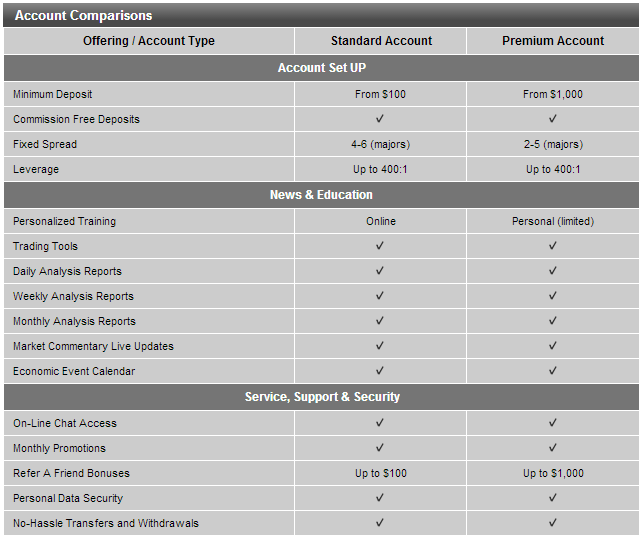 The Standard Account is available with a minimum deposit of $100. The fixed spreads are between four and six for majors. You can leverage up to 400:1. Also, with this plan, you get market commentary live updates, weekly analysis reports, trading tools, the economic event calendar, monthly analysis reports, daily analysis reports, and personalized training online. 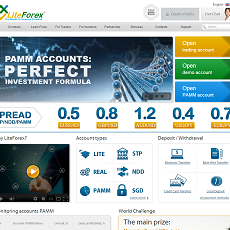 You can get the Premium Account with a minimum deposit of $1,000. All deposits are commission free. The fixed spreads are between two and five for majors. And, leverage is up to 400:1. You also have access to daily, weekly, and month analysis reports; personalized training; the economic event calendar; market community life updates; and trading tools. The biggest downside to XForex is that they do not have a mobile app. 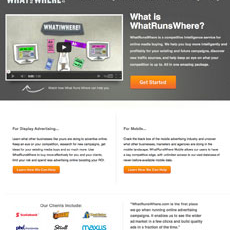 You can access their web based platform using your smartphone or tablet, and it works just fine. But, an app would be easier. That was about the only issue we experienced with XForex. We took to the web to find out if there was any negative chatter about XForex. All we saw were some unfounded claims that XForex is a scam. There was not any information to back up these claims. This is fairly typical in the forex realm with so many brokers competing for traders. Some resort to online attacks. A lot of times, forex trading platforms fall below satisfactory in their interaction levels with customers and traders. Getting immediate help is often times difficult. With XForex, this was not the case at all. Users can get instant responses from knowledgeable and friendly customer service representatives 24 hours per day, five days a week: whenever the markets are open. 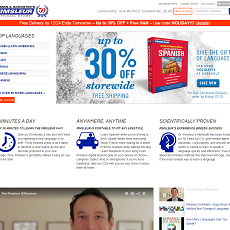 In addition, they have a phone number, tutorials, a FAQ, and plenty of other documents. 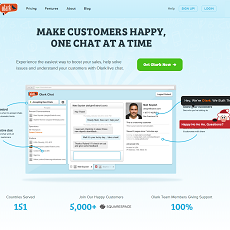 We tried out the live chat at an odd hour and were greeted by a cheerful expert who was more than willing to help us. 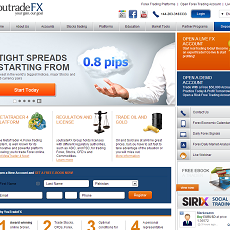 XForex offers competitive trading spreads that are some of the best in the industry. It is closely regulated by market regulation organizations all over the world, so you can feel secure using XForex. 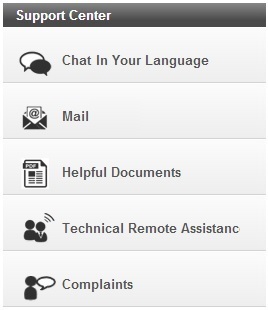 Plus, they make sure their customers are taken care of with excellent customer support and a web friendly interface. 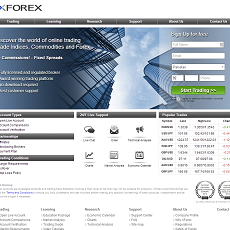 We strongly recommend XForex for online forex trading. 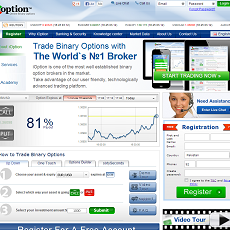 filed under Binary Option Brokers, Finance Reviews . 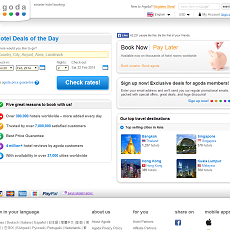 filed under Hotel Booking Service, Travel Reviews .